Of course, getting all this work done has created even more projects! I've discovered the bar stools need their seats reupholstered. That's an easy one at least. I even already have fabric left over from last time :). The curtains in my kitchen basically fell off the walls when I was vacuuming the dust off the tops, so I decided to replace them with cornices. Which, of course, means building cornices. Speaking of Beasties growing up: Beastie 1 has a pillowcase I made him when he was about 18 months old. That would be over 11 years ago, sigh.... It's...well, let's say, you see more pillow peeking through these days than case :P. (It's not the pillow he sleeps on, btw, it's a little one he just sets on his bed.) We picked out a really cool dragon fabric, and I'll have to borrow my mom's sewing machine and make a new case. Oh, check it out--I found an image of the fabric! And speaking of Jeff: They say opposites attract. This is most true for us. Jeff is a pack-rat and a set-it-where-he-uses-it kind of organizer. I'm an anti-pack-rat, and an obsessively put-it-away-or-throw-it-away organizer. Long story short, we bought a cabinet to put in the kitchen next to the bar area where his laptop and mass-of-junk-that-makes-my-eyes-roll-back-in-my-head lies spread across the counter. Wish us luck. Pray for us. This has to work or I may one day douse the whole mess with the kitchen sprayer. Your mind will feel so much calmer with a clean house. New Years cleaning - just say you're going with Japanese custom if people ask! ;) What are cornices? 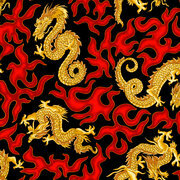 That's really cool dragon fabric. Very neat. My munchkin is having a zebra-decor birthday party. The invites had a zebra border and suddenly everything had to be zebra. The cabinet should work so long as he keeps it shut so you can't see the disaster within, right? Good luck! Cornices are like solid-structures instead of curtains. The ones I make are wood wrapped in fabric. Beastie 2 has zebra bedding and will have zebra border. She's trying for just about zebra everything, but I'm putting down limits ;). You are so funny w/ your beasties...and now I see another area we are similar yet different. I LOVE being organized, but I am also a piler...but moving has helped me with all that. You ask yourself.."Do I like this enough to pack and unpack it?" You are my sewing hero...Did you teach yourself how to make cornices? I love the one by your table. Maybe I will give it a go. Any helpful hints? ?